The Jewish Food Society Wants To Save The Recipes Of Grandmas Everywhere : The Salt A new project aims to celebrate Jewish food and culture in all its diversity. It's collecting recipes from the Jewish diaspora and staging public events where stories behind the recipes are the stars. 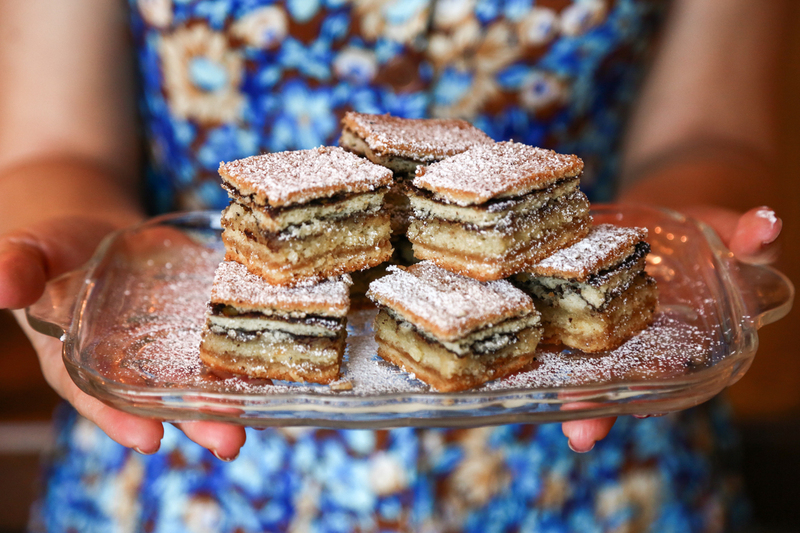 Idan Cohen's grandmother's famous German layer cake. Idan's mom always said that the Israeli climate did not agree with this cake, but she made it anyway. 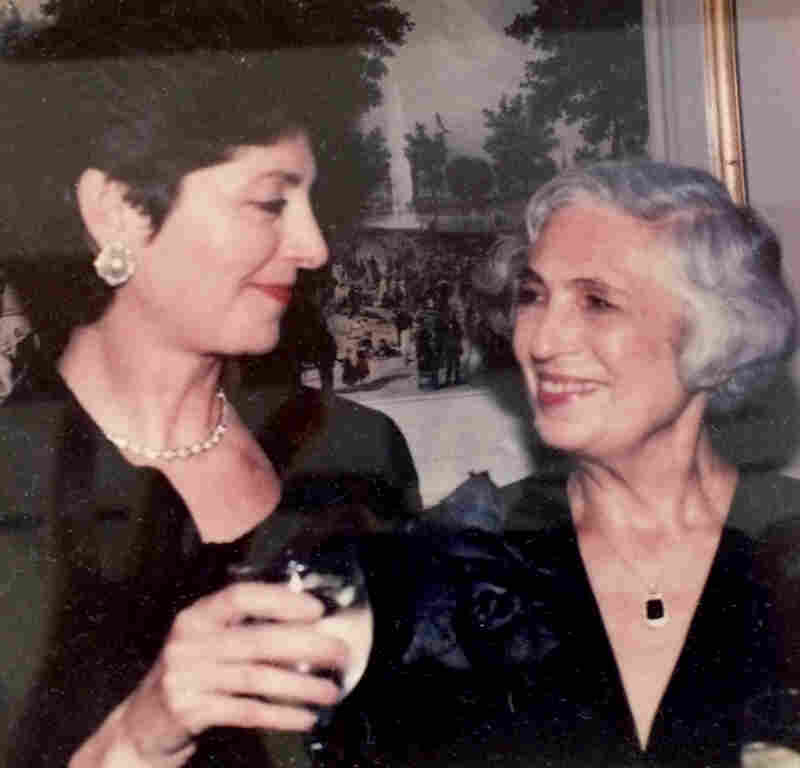 The Yiddish word schmaltz and its adverb cousin schmaltzy refer to two very divergent concepts: rendered chicken fat — that hard stuff on top of a cold homemade soup — and something that is overly sentimental. When it comes to the foods we love and cherish, there can be no shortage of either. Naama Shefi would agree. Recently, over a bag of schmaltz-infused popcorn, 90 people came together in lower Manhattan to celebrate the formation of the Jewish Food Society, a new organization Shefi created that aims to honor the global wonder of Jewish food. Naama Shefi recently created the Jewish Food Society, a project that aims to honor the global wonder of Jewish food. Born on a kibbutz in central Israel, Shefi's early days included the highs and lows of childhood food: pizza at the communal dining hall and adventures at a local market. It also included the army, a prerequisite for all young people in her country. When she was done, Shefi moved to New York, where she earned a Master of Fine Arts in film from the New School. But for her, it's all about the food. Before starting her society, Shefi organized a press trip of food writers to Israel while working for the Israeli consulate planning local New York cultural events; she worked for Eat With, a company focused on dinners inside people's homes; and she hosted a 21-day Iraqi-Jewish food pop-up featuring kubbeh, a food Shefi craved but could not find easily in the city. Lines for the sold-out dinners wrapped around the block. "I've been dreaming about the Jewish Food Society for the past decade and I did all sorts of projects to promote this dream," says Shefi. She imagines a real home for dinners, pop-ups, Friday night Shabbat celebrations and a library. To start, she's focusing online. Along with her program director, Ellie Backer, Shefi is building "a robust collection of recipes from all Jewish ethnicities that will inspire people to cook and learn more about Jewish culture and history." The recipes will be sourced from home cooks, established chefs and authors. There will also be community gatherings to celebrate the life that rotates around food. 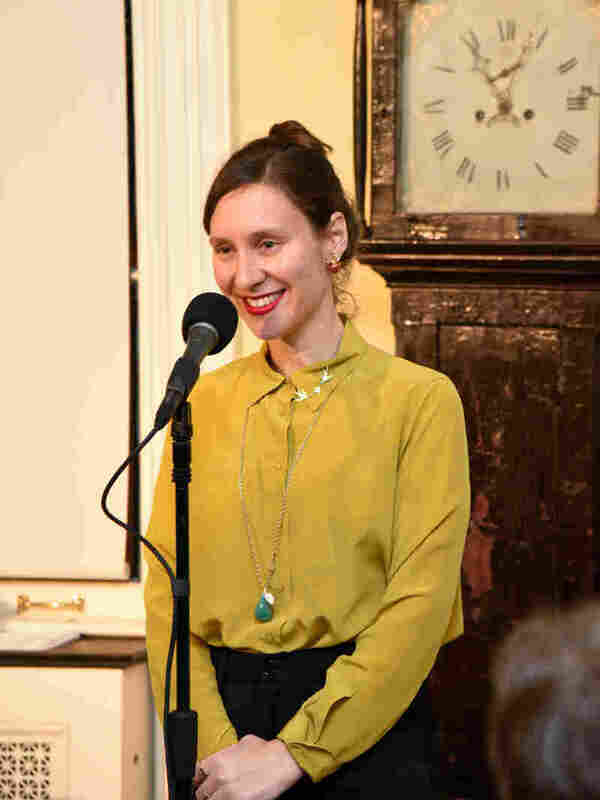 The first public event was called Schmaltzy and it featured five storytellers who shared meaningful "behind-the-recipe" stories from their past. Liz Alpern baking Rice Krispies treats as a child. Alpern was one of the storytellers at Schmaltzy. 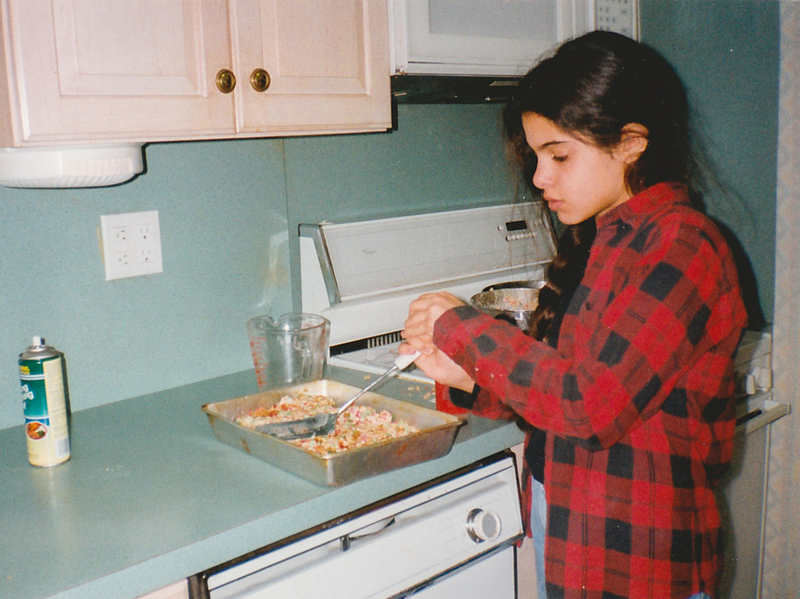 She says growing up, her Long Island family was not known for cooking. "We made cookies that you sliced and put in the oven. That was baking." "We like good food and company, but even more we appreciate stories and the cultural DNA they carry," says Shefi. Schmaltzy brought together all sorts of people: tech workers, business entrepreneurs, food lovers, Israeli friends, doctors, bubbes and bakers. It was held at the Henry Street Settlement, which provides a range of social services to residents of the Lower East Side. The crowd was a blur of conversation and moving hands. Food does that to people. The small upstairs room had a fireplace (not necessary) and a piano (necessary). For emcee Mitchell Davis, executive vice president of the James Beard Foundation, an organization that celebrates chefs around the country, the launch of the Jewish Food Society was a mitzvah — a good deed. "I think it's important that it begins from an Israeli perspective and has a home in the U.S. This way it will be much broader and more inclusive," says Davis. The storytellers of the night came from afar: Israel, Morocco, Latvia and even Long Island. Liz Alpern, the co-founder of Gefilteria, a contemporary gefilte fish company, says her Long Island family was not known for cooking. "We made cookies that you sliced and put in the oven. That was baking," says Alpern. But on Fridays, the food mattered. "That was when the house smelled of roasting chicken and potatoes," says Alpern. Anna Gershenson smiles at her mom, Rhoda Gurevich, as they celebrate her 70th birthday at the Ritz Carlton in Boston. Even though gefilte fish is an iconic dish of Passover, Alpern is not lighting a candle to the past. "One thing that really influences my ethos about Jewish cuisine is that I'm not particularly interested in preserving anything. I'm interested in seeing it move forward," she says. For Alpern, the Jewish Food Society has a great role to play in curating recipes that are anything but static. "Food is always changing," says Alpern. "Recipes that came from Europe radically transformed when they came to North America," she says. Idan Cohen, the CEO of Grow, a technology startup, began his talk with sounds. "The noise of the mixer in the kitchen, clanking pans and flour flying everywhere. I would complain about the noise, but my mom said, 'If you're going to complain, you're not going to get any cake.' "
Cohen made his mom's German layer cake, which was a recipe passed down from his grandmother, a woman he never met. "I feel like food is the underlying genome of culture. It's what brought humans together to form groups of hunter-gatherers, and it's what connects us today to where we came from," says Cohen. Einat Admony, chef and owner of Balaboosta — a restaurant in Manhattan and also a Yiddish term meaning the perfect housewife — recalled a spicy and fragrant Yemenite sauce that her father made called S'rug. Those beautiful kitchen smells — spicy pepper, cilantro, garlic — are what Admony and the Jewish Food Society cherish. "I opened my first joint in the West Village and my dad's amazing recipe was on the menu. He was so proud," says Admony. Food is the mortar that binds communities. "There was not a single moment I was by myself. I didn't cook alone or eat alone, it was always a group activity," says Ron Arazi, another Schmaltzy speaker. Arazi created NY Shuk, a Middle-Eastern sauce company based in Brooklyn, with his wife, Leetal. The nonsectarian Jewish Food Society is for anyone who loves food, not just Jews. Naz Riahi, founder of media company Bitten, eyed the platters of German layer cake and exclaimed: "I'm a Muslim, and I'm here. Culturally it is so similar to Iranian culture." Anna Gershenson, a Latvian cook and teacher, glowed as she spoke of her own mother: "I am very drawn to a picture of me and my mom, smiling at each other. She was a gorgeous woman, full of life and a magnetic personality." Later, as she ladled out her mother's kreplach soup — slightly changed from beef to chicken — one could imagine that the secret to cooking was merely to remember it. "Food is unique. It doesn't exist except for story. It is just too small and personal and consumed. All you have are the stories," says Davis.